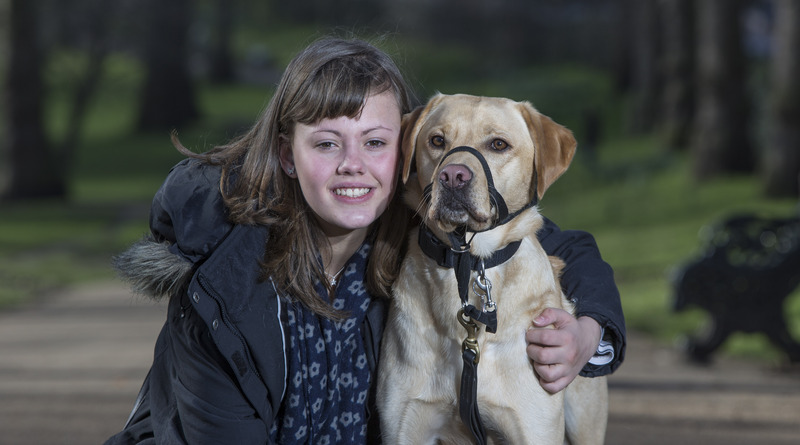 Last month Tenterden teenager Sophie Pearman, who has Type 1 diabetes, took part in the Eukanuba Friends for Life finals at Crufts with her diabetic alert dog Scooby. Here she describes their exciting day at the world’s largest dog show. I always knew from watching the TV that Crufts is a big deal. But it wasn’t until I actually stood in the main arena with thousands of people looking at me and my dog that it suddenly dawned on me just how big it is! And what an achievement for Scooby to be there at my side. Sunday was probably one of the most stressful days of our lives together. We had non-stop rehearsals, photo shoots and press interviews, so there wasn’t much time to do anything else. I was amazed at how well Scooby coped with it all. He is usually so sensitive and sometimes shy but he walked around as if he owned the place and me. Scooby helped me so much during the day when things got a bit stressful, alerting me 10 times to warn me that my blood sugars weren’t right. He even changed the way he alerted. Normally he licks my hand or paws at me but at Crufts, where it was so crowded, he would go in front of me sit down and woof. This was him telling me to sit down and do my bloods. Scooby was always right and everyone was so impressed with him. We even had to stop the dress rehearsal as he did a fantastic alert to my blood sugars rising (because I was so stressed). We had to stop do a quick injection and then carry on. He took it all in his stride posing for the camera, letting people come and say hello. I was so proud. When it came to the grand final as we waited backstage ready to be called on, my brother and mum went into the audience and Scooby licked my hands. I was shaking so much with nerves but I knew that I had to go on – this was about Scooby, not me. We walked on to a mass of applause and a roar from the crowd. People were screaming out Scooby’s name. Before we led the way into the arena Scooby stood still, looked up at me and we walked on with our heads held high. I felt so proud I couldn’t stop giggling to myself, holding my Auntie Claire’s hand for support. We didn’t win, but that didn’t matter to me. Standing in front of all those people with my best friend Scooby – telling the world how much he does for me – was an experience I will never forget. Now so many more people know about the fantastic work that diabetic alert dogs do for people just like me – and Scooby has helped to raise the profile of Type 1 diabetes too. Scooby and I are a team – we do everything together and I am so, so proud of him.